As Yousuke’s car started climbing the mountain pass leading into Akou proper, Mrs. Terumi Kawatobi mentioned how she always cried whenever she saw any of the popular 47 Ronin/Akou Incident based TV show and movie reruns, so prevalent in Japan during the first half of December. Just about any Japanese lady of her generation would get a little weepy during such a show but in Terumi-san’s case it was because she really understood the tremendous burden her ancestor placed upon the shoulders of his retainers, and truly appreciated what the loyal samurai went through to avenge their liege. Yes, Terumi-san is a direct descendant of Lord Takuminokami ASANO, whose death by seppuku (hara-kiri, as the ritual is more popularly known in the West) started the Akou Incident. December 14th is known nationwide as Uchi-Iri-No-Hi, meaning “The Day of The Raid.” Which raid might they be referring to? None other than that of the 47 Loyal Retainers of Akou. In the U.S., the group is better known as the 47 Ronin. Officially known as the Akou Jiken (Akou Incident), here is a very brief synopsis of what happened. It was snowing on the night of 14-15 December 1702. At about 3:30AM, 47 samurai stormed a residential compound in present day Ryogoku. They took the head of Minister Kouzukenosuke Kira, who was the Chief of Protocol at Edo Castle. This was to avenge the death of the Akou Liege, Lord Takuminokami Asano, who was forced to commit ritual suicide (seppuku, perhaps better known in the West as hara-kiri) after he attacked Minister Kira within one of the Edo Castle buildings almost two years previously. 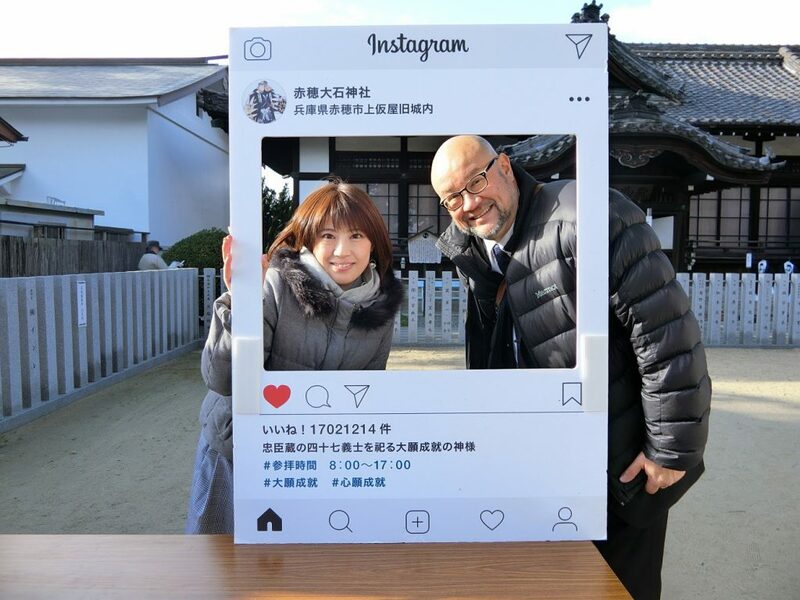 Through the auspices of Yousuke Takenaka (General Hanbei TAKENAKA’s direct descendant and my good friend), your humble scribe was invited to attend a memorial service held at Oishi Shrine, in Akou city, on December 14th. 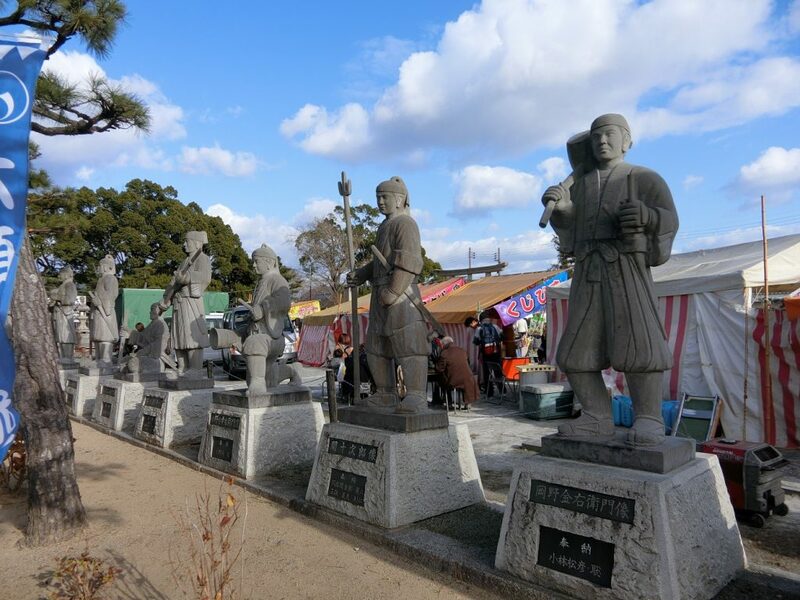 The service would be held in front of descendants of the 47 Ronin. (the current term used in Japan to refer to the 47 is “Gishi,” short for Loyal Warrior. I will henceforth use “Gishi” instead.) The invitation was extended to me by Terumi-san. I made the trip to Himeji, where both Yousuke and Terumi-san live, on December 13th. Himeji is a city on the shores of Japan’s Inland Sea and is slightly west of Kobe. Himeji boasts an impressive castle, not a reconstruction but which actually dates to the early 1600’s. The castle is designated a UNESCO World Heritage site. I had always wanted to visit the castle, so I took the opportunity to arrive early in Himeji to visit the castle. Unfortunately, my knees were acting up that day so while I was able up to the donjon entrance, I had to forgo going inside the donjon itself. 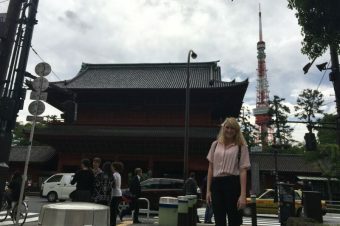 Previous experience had taught me authentic Japanese castles had very steep stairs, more like ladders, and I didn’t want to have to cancel going to the memorial service the next day. That evening, I was introduced to Terumi-san at a lecture presented by the lineal and direct descendent of Lord Mitsukuni TOKUGAWA, whom is also the subject of a long running Japanese TV series spanning five decades. Around 9AM the next day, we left Himeji in Yousuke’s car to arrive in Akou by 1030. It was about 10 when we hit the pass, which is where Terumi-san started talking about her perspective (i.e. the official Asano family version) of the Akou Incident. But first, a little history. After Lord Asano caused the incident at Edo Castle and was forced to commit seppuku, the Tokugawa government decided the Asano Clan would be shut down and the fiefdom and castle given to another Lord. Immediately, the samurai of the Akou Asano fiefdom were made masterclass (i.e. ronin). About half immediately left to pursue their fortunes elsewhere. It is well known Kuranosuke Ohishi’s preferred option was to restore the Akou Asano clan by petitioning the government to let Lord Asano’s younger brother, Daigaku, re-establish the fiefdom. Once this request was denied, Kuranosuke Ohishi determined to avenge his Lord’s honor and started planning a raid to take Kira’s head. At this point, he surveyed the remaining Akou samurai, whom all decided they would join him on his quest. The commonly cited version of why this number dwindled down to the final 47 is because many couldn’t handle the abject poverty associated with being ronin, and/or the stress of having to wait so long (almost two years) to avenge their Lord. Those whom seemingly abandoned the quest are universally panned as quitters by the Japanese public. According to Terumi-san, this was not the case. Kuranosuke Ohishi is widely acknowledged as a careful and meticulous planner. For the December 14th 1702 raid, he left absolutely nothing to chance. For such a person, the chances of having a single raid fail, all involved executed, and having no further options to avenge their Lord was absolutely unthinkable. He therefore decided to split his remaining samurai into three groups. If the first raid failed, the second group would avenge their Lord. If they also failed, then the onus would be put upon the third group. This yielded three separate chances to avenge their Lord. To give the first raid the greatest probability of success, the most skilled samurai were gathered into this first wave. After all, a failed attempt would only serve to put the Kira household on high alert and the element of surprise would be lost. In fact, Terumi-san even mentioned a village where a high percentage of the “missing” settled down to bide their time, but I cannot remember the name of it. OK, back to the present. After arriving in Akou city and parking the car, we hoofed it to Ohishi Shrine. Hmmm, the name Ohishi (pronounced “Oh-Ishi”) sounds familiar, doesn’t it? Yup, it is the name of Kuranosuke Ohishi, the leader of the 47 Gishi. 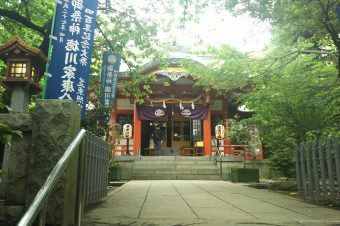 Ohishi Shrine was constructed on the site of Kuranosuke Ohishi’s residence in Akou to enshrine the souls of the 47 Gishi. 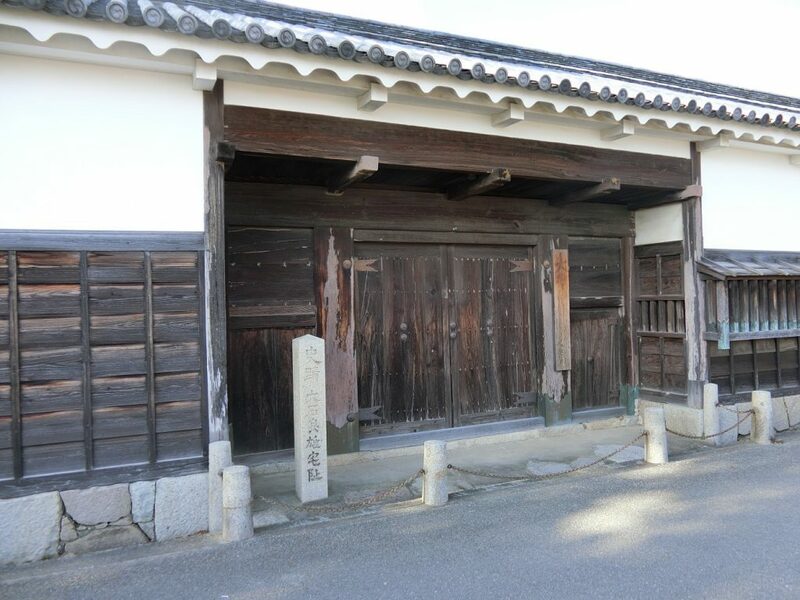 In fact, the front wall and gate of the Ohishi manor still mark one boundary of the shrine grounds. 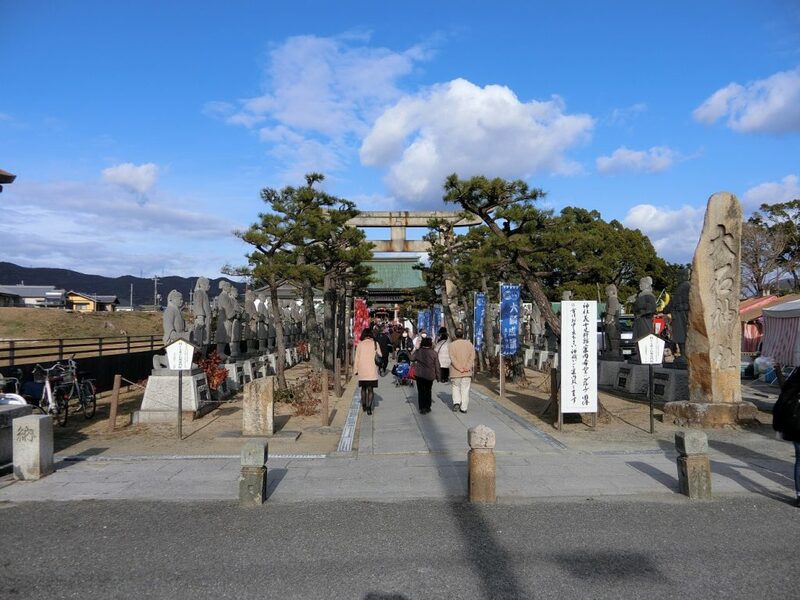 It is said Akou residents secretly constructed a small shrine within the Ohishi manor grounds soon after the Akou Incident but were unable to openly worship the 47 Gishi for fear of incurring the wrath of the Tokugawa Shogunate. 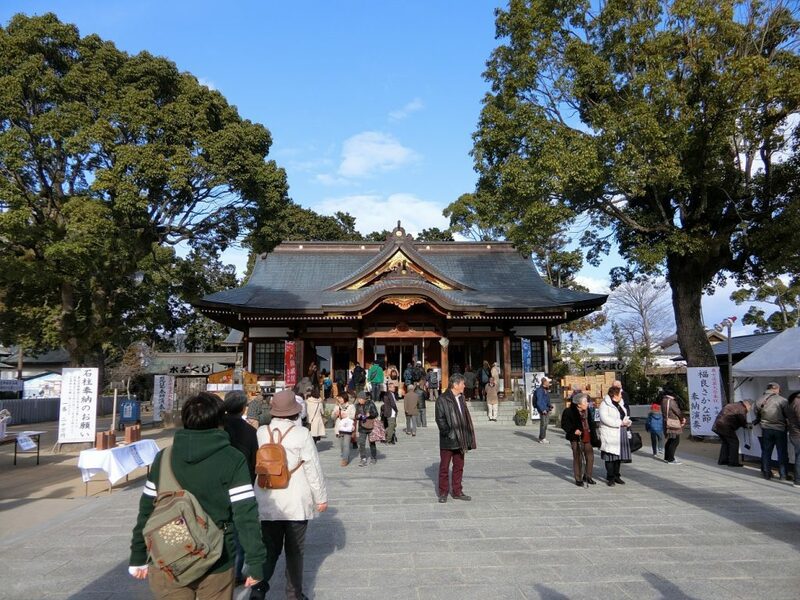 In 1900, 30 some years after the Meiji Restoration, permission was granted to formally construct a shrine, and Ohishi Shrine was completed in 1912. 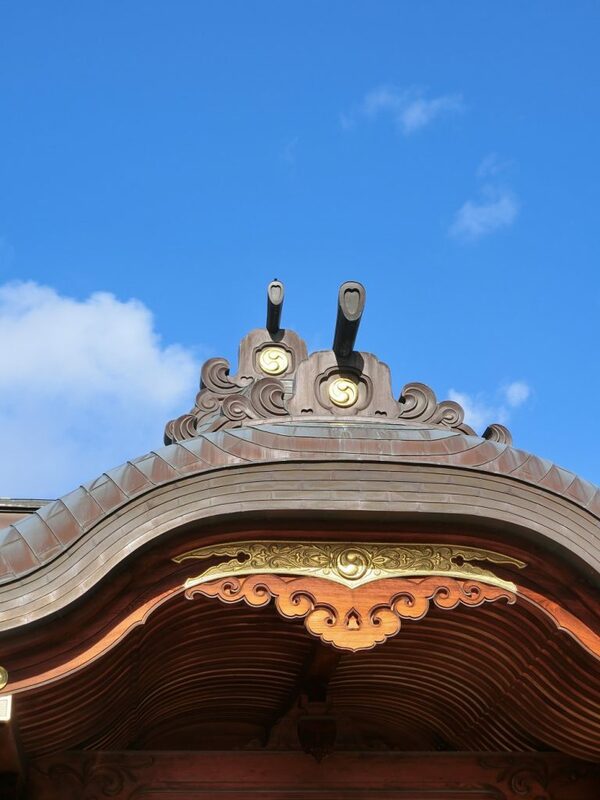 Here one can see the Ohishi family crest on the shrine main pagoda roof tiles. 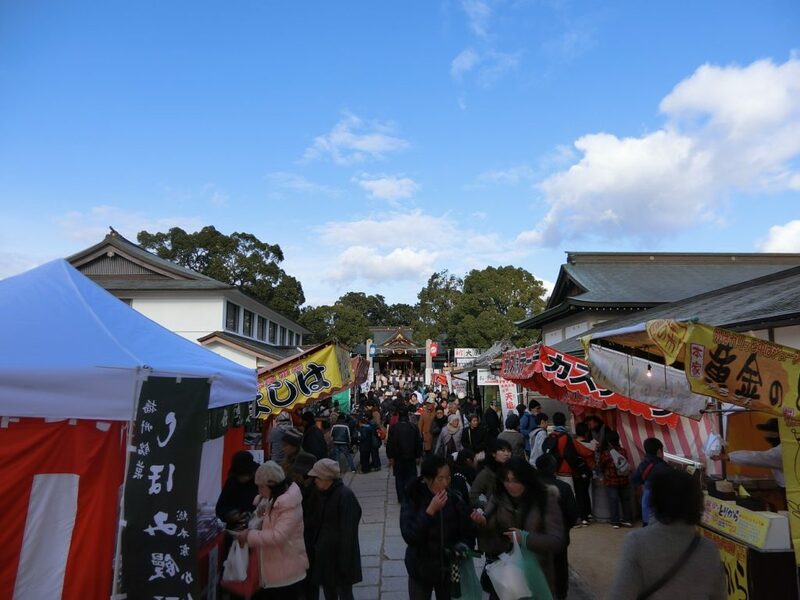 On this particular day, Akou city and Ohishi Shrine were teeming with visitors gathered for the yearly 47 Loyal Samurai Festival, honoring the 47 Gishi. 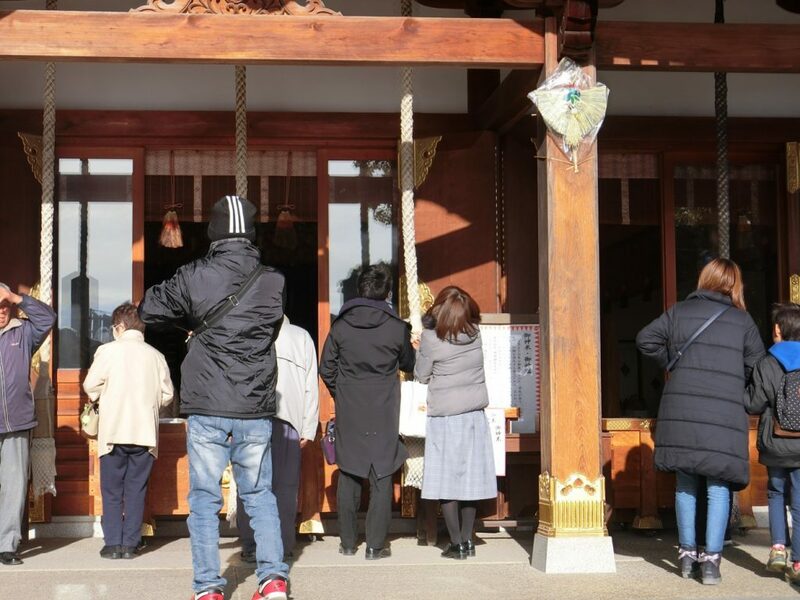 The first thing a visitor to Ohishi Shrine will notice are the 47 stone statues which line the pathway between the torii gate and gate leading into the shrine proper. 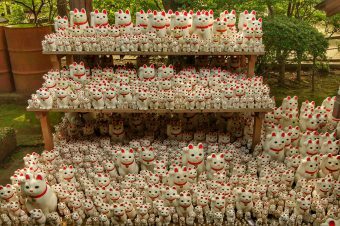 Each of the 47 Gishi has his own statue. We were running a bit late, so we hurried into the shrine proper and introduced ourselves to the Chief Priest, Mr. Iio. After a short stint in a waiting room, we were then escorted into the shrine’s main pagoda. After the descendants of the 47 Gishi filled the middle bank of benches, the two side banks were filled by local residents dressed as the 47 Gishi. Finally, noted Kabuki and TV actor Baijyaku Nakamura, portraying Kuranosuke Ohishi, was ushered in and seated on a chair just in front of me. Since the ceremony had yet to start, I pulled out my camera and took the picture used as the cover photo for the story. Then the shrine priests came in and the memorial service started. Out of respect I did not take any pictures during the actual ceremony. I do remember having to stand up and bow many, many times. When the ceremony concluded and we all got up to leave, a young couple approached us. I was then introduced to Terumi-san’s granddaughter Yuka-san. The young man with her was a friend, Yoshiyuki-san. We all went up to the waiting room where lunch was to be served. Yuka-san is a very vivacious and lovely young lady, and one of the other nearby participants (a complete stranger) decided he would sing a traditional Japanese song to honor her. Terumi-san cried during the song. It was plainly evident Terumi-san loves, and is loved by, her granddaughter. After lunch I asked Terumi-san and Yuka san if I could take a picture of them for this article, and they readily agreed. 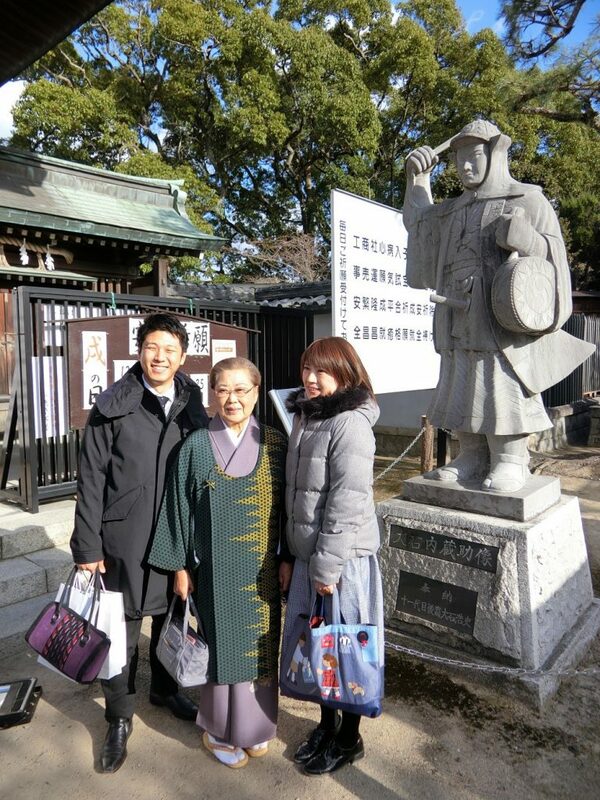 We decided the best place for the photo was in front of the statue of Kuranosuke Ohishi, and here is the shot. The young man is Yoshiyuki-san. The party went off to see the Akou City Historical Museum. I tagged along partway in order to take some pictures of the Ohishi manor gate. The kanji character for “Oh” is still visible on the wooden nameplate. I then begged Terumi-san’s pardon to return to the shrine and take some photographs for this article. Yuka-san and Yoshiyuki-san decided to accompany me. We started out at the stone torii and worked our way to the shrine proper. 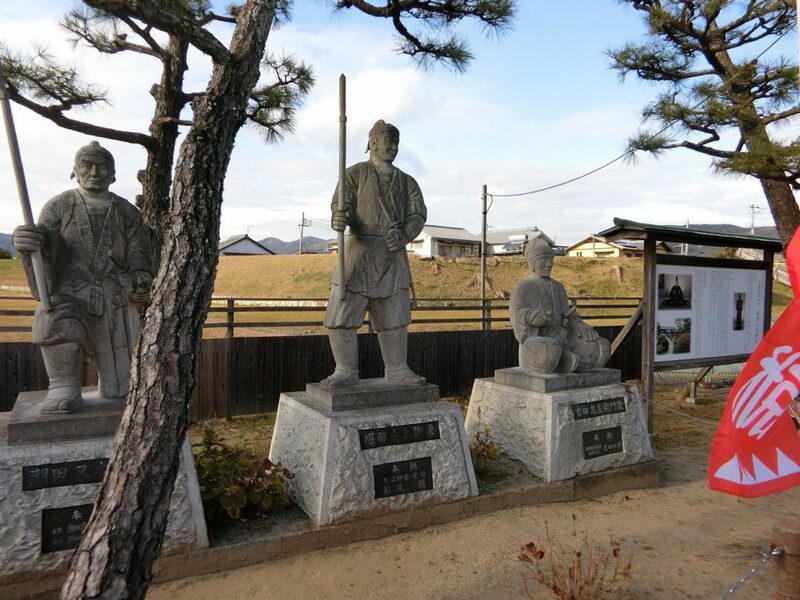 The various Gishi were portrayed holding various weapons. Since my favorite Benkei weapon is the BFH, I decided to take pictures of the warriors holding the large hammers used to break down doors at the Kira residence. However, I also took a picture of Yasubei HORIBE, probably the most famous of the 47 Gishi, after Kuranosuke Ohishi. As you can see, the shrine was in full festival mode and hosting a lot of visitors. Yuka-san and Yoshiyuki-san drew two different types of fortune. First was the standard folded piece of paper. Next, the two drew a type of fortune I had never seen before. These were pieces of paper with various categories printed on them, but the actual fortune and advice content seemingly left blank. Wondering what was going to happen, I watched the two gently place their blank fortunes into a small stone basin full of water, and the “invisible ink” words started to appear. Cool! Lying on a table near the main pagoda was one of those “Instagram picture frame” things. After I took a picture of Yuka-san and Yoshiyuki-san posing inside the frame, the two urged me to take a picture with Yuka-san. I was a bit hesitant, after all I really didn’t want the spirits of the 47 Gishi to think I had less that honorable intentions towards their liege’s precious descendant. They are definitely NOT the type of people you want to make angry! However, the two really urged me on, so I had them take my photo while making certain there was plenty of daylight between myself and Yuka-san. 1. Place some money in the Saisen (monetary offering) box. 2. Take the bell rope and give it a few jostles to ring the bell. 4. Clap twice, but on the second clap keep your hands together, bow your head and offer your prayers. 5. When finished, bow once again. We then left Ohishi Shrine to rendezvous with the others at the museum. Unfortunately, photography is not permitted within the museum. Returning now to the descendants of the 47 Gishi. Normally when an incident such as the Akou Incident occurs, not only is the perpetrator punished but so are three generations of his family (wife, children and grandchildren). This was done to forestall the possibility of revenge attacks. However, Japanese public opinion was very much in favor of the 47 Gishi. The Tokugawa Shogunate had some other sticky problems to deal with, so it was decided to spare the usual punishments instead of turning public opinion firmly against the government. Wives, daughters, and granddaughters were spared any punishment. Of the boys, only 4 boys over the age of 15 were sent into exile, and any younger boys were to be exiled when they turned 15. However, when the reigning Shogun’s mother died, the proviso about future exile was waived as part of a general pardon, and when the Shogun himself died, the three remaining exiled children (one died during exile) were brought back as part of another general pardon. The 47 Gishi were so highly revered amongst the Japanese samurai, to have the blood of such a warrior became like a favored brand, and the 47 Gishi children were widely sought after either to serve as samurai or adopted sons in fiefdoms all over Japan. Even Daigaku Asano, who was repo-ed by the main Asano Clan branch in Hiroshima following the decision to completely shut down the Akou Asano fiefdom, was eventually restored to respectable samurai status. Lord Asano’s immediate family members (Terumi-san’s ancestors) were taken in by Lord Wakisaka of the neighboring Tatsuno Fiefdom. 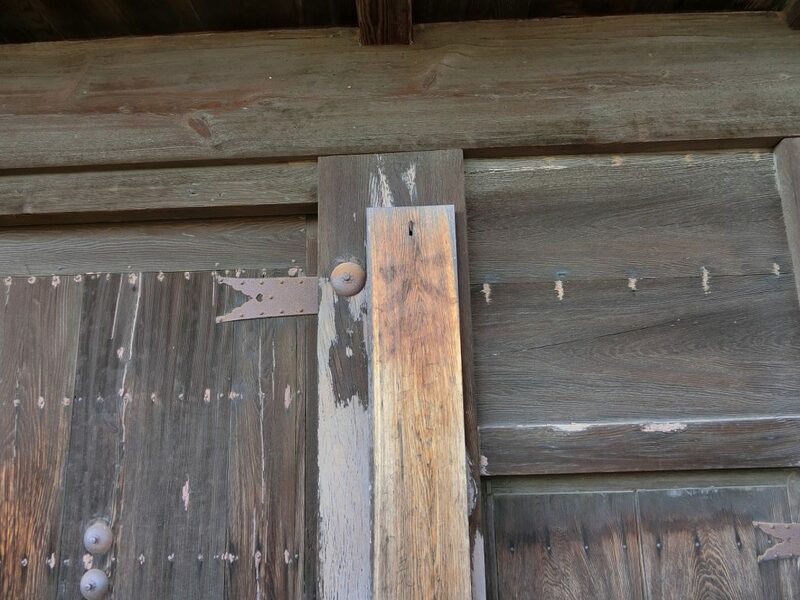 Lord Wakisaka stated he did so because he was extremely impressed by the detailed accounting of Akou Asano clan assets (required for the castle turnover), down to each individual arrow. We left Akou around 5PM and headed back to Himeji. Terumi-san decided she would take us all out for dinner, so once we reached Himeji we stopped in at a local restaurant. Over yakisoba and okonomiyaki, Terumi-san and Yousuke started telling me about what it was like as a child being brought up in a samurai family, even in these modern times. Three memorable vignettes stand out. Both Terumi-san and Yousuke mentioned how as preschoolers they were taught about death and how to face it. Wow! I don’t think I could have handled it when I was that age. Yousuke talked about the nightly ritual required when his father returned home from work. Once the family heard his father’s car in the driveway, Yousuke and his siblings would have to gather in the family room and sit formally. Once their father entered the room and sat down in front of the them, the siblings were required to report, in eldest to youngest order, their activities for the day. Terumi-san said she had to start learning formal tea ceremony from the time she was in primary school, because “all important matters are discussed in the tea room.” Her appeal of “but we don’t even have a tea room” fell on deaf ears. I had to LOL at that one. And that brings this narrative to the end of a very enlightening and rewarding day, spent in the company of Lord Takuminokami Asano’s descendants, Terumi-san and Yuka san.